Last night I finished stitching the last leaf on Star of Yesterday. 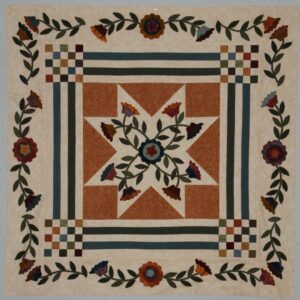 Here is a picture of the quilt on the cover of the directions. 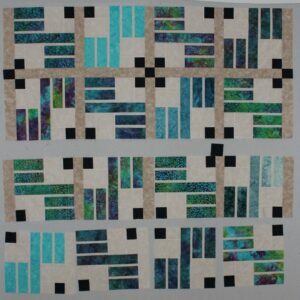 I am very pleased with the color design changes that I made to this quilt. It feels great to get another item marked off of my end of year to-do list, especially since Strip Ribbons hit a snag. I don’t like the darker brown sashing that I used in the top three rows. It was one of those things where I wasn’t sure about it, but once I put in the horizontal sashing between rows one and two – no way. Now I will be best friends with my seam ripper. It is such a pain, but I will never be happy unless I fix it. After thinking about it overnight, I have decided to use the block background fabric for the sashing. That way the colored strips will look like they are floating on top. Time to settle back on the couch with a good movie and my seam ripper. 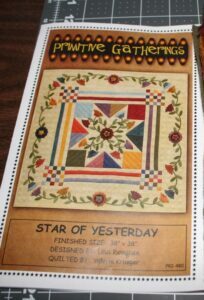 Star of Yesterday – surprised you even bought the pattern based on the cover photo! Your changes are stunning.